We love the holiday season with family get-togethers, good food, gifts and loved ones that make life tremendously meaningful. We will spend hours shopping for our loved ones and cooking our holiday feast from our favorite recipes. Whether we are baking Christmas cookies with Lemon and Rosemary or putting oranges in Christmas stockings, citrus are a big part of the Christmas holiday and with it brings warm feeling of nostalgia. Each and every year, we decorate to beautify our homes and make them look inviting. With wreaths of green and colors of silver, gold, red, orange and blue, and trees made up of our kids holiday trinkets, along with our baby’s first Christmas ornaments and keepsakes that help make our holiday special and unique. This year why not start a tradition of your own that is unique that could define a new tradition in your family? Of course we will keep the old traditions alive because they are special to us and that is why we continue them, but we can create new ones that will inspire generations and they may pass on from us our own unique ideas of holiday cheer. It’s an exciting thought to create a tradition that might get passed down to our children and future generations. Trees are just part of the holiday cheer and tabletop citrus not only make a beautiful centerpiece but also bring the citrus smell of Christmas into the environment, that continues on long after the Christmas Holiday and New Years. Clementine Trees are also known as the Christmas Orange Tree and they produce bright mandarin oranges which are smaller than the average oranges,. The fruit is incredibly sweet, seedless, and easy to peel, making it a great orange for even small children. The Meyer Lemon is a fabulous tree for any occasion, it’s ever-bearing quality makes it one of those “must have trees” it is simply a gorgeous tree and because it can bloom anytime of year, its a real favorite and helps bring springtime into our homes. Long winters can be a bit depressing with the cold, especially in northern regions of the United States where blizzards can keep us restricted to the indoors. A Meyer Lemon Tree can make the space substantially less depressing as it blooms and produces flowers and fruit. Persian and Key Limes are favored fruit for those football fans that love to drink while watching their favorite teams, or just for holiday get-togethers. Garnishes of lime wedges are meant to enhance the existing flavor of beverages. Limes are used for cocktails, beer, desserts and succulent meat dishes. Meiwa Kumquat is a lovely tree that produces small round orange fruit about the size of a large cherry tomato. The whole fruit can be eaten including the peel. It's a sweet-tart flavor balance. The fruit makes fabulous ingredient for favorite desserts and beverages. Our trees are simply a unique gift idea and can make winter less depressing and dress up the Holidays with good will, give homegrown ingredients and make a wonderful conversation piece for your special holiday that could cause generations after you to follow in your footsteps as they desire to keep your tradition alive. This entry was posted in Other Articles, Tips & Ideas, Meyer Lemon Trees on November 20, 2018 by Nancy @LemonCitrusTree. Soggy wet roots are the leading cause of problems with container grown citrus trees. Many of those problems can be eliminated with careful container choices and a moisture meter that can prevent over-watering. Clay pots are classic but heavy choices. If you live in the southern part of the country, you may want to avoid the clay pots, as they dry out very quickly and you'll spend a significant amount of time watering in hot summers. If you plan on using clay be sure the mouth of the pot is as wide or wider than the pot itself, avoid the spherical pots with the mouth of the pot curving inward, these tend to be wide and shallow and don't have the depth needed for the deep root growth and if you ever need to transplant you may have trouble getting the root ball out if the opening of the pot is smaller than the width of the whole pot. Wood containers degrade over time, allowing roots to grow into cracks and have irregular surfaces, making it harder to transplant. While transplanting you may be ripping roots out between cracks to dislodge them, so avoid the wood and look for something comparable like a plastic barrel that you can drill additional holes in. Many plastic barrels look very similar to the wood barrels. The self-watering pots are NEVER recommended for Citrus trees. Citrus require infrequent deep watering, so self-watering pots do not allow for this. The self-watering type can cause overly wet roots. Also, pots that have the catch tray or saucers attached are not recommended, trees do not like "wet feet" and those types of pots can cause root rot. Cloth container pots are not recommended. The cloth can become misshapen over time as the soil settles. During the watering process, some of the soil may relocate in the pot, and this can cause the tree to eventually tip out of its container since the soil is not held firmly into place with solid sturdy sides. The cloth pots just do not work well because they are far too flexible allowing the soil to reshape the pot during the deep watering process, which will cause the tree to tip out because it has nothing sturdy to hold the soil in place. 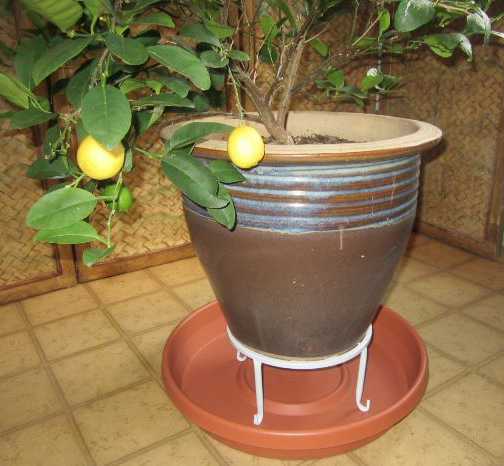 Hard plastic pots come in a wide selection of designs and colors, making them the ideal choice for citrus trees. When choosing a pot, be sure you can actually see drainage holes in the bottom, if not it is the wrong pot. The sides should be sturdy and the plastic strong enough to drill additional holes in the bottom if needed. Plastic pots are easier to handle and more lightweight than clay and resistant to breakage. Four to five large (3/4"-1") holes are the minimum necessary for adequate drainage. Select a pot that makes it easy to inspect your tree or re-pot if needed. Smooth tapered sides with a wide mouth at the top work the best. Avoid shapes that are narrow at the top or other designs that would impede the root ball from easily sliding out. Do not add stones or gravel in the bottom of the container. 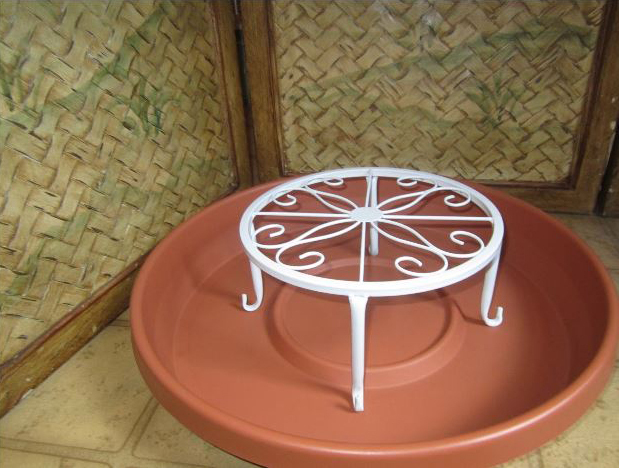 Elevate the container pot off the drainage-tray or ground to allow the water to exit the container after watering. Water according to pot size and do not go beyond a 10-gallon container. This entry was posted in Tips & Ideas, Meyer Lemon Trees, Avocado Care, Citrus Care, Uncategorized on October 24, 2018 by Nancy @LemonCitrusTree. Trees will die without the essential requirements. Incorrect watering is the most common cause of issues and tree death. 3. Only water when the meter reads 4. 6. 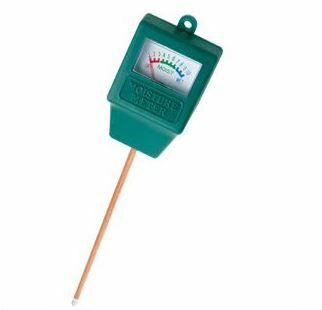 Once the tree has been watered properly, recheck the moisture level again to make sure the meter reads high (9 or 10) and then do not water again until the meter reads 4. This entry was posted in Tips & Ideas, Meyer Lemon Trees, Avocado Care, Citrus Care, Uncategorized on October 19, 2018 by Nancy @LemonCitrusTree. Imagine cultivating your favorite fruits at home and relishing them fresh off the tree whenever you feel like it! At LemonCitrusTree, we help you plant dwarf citrus and fruit trees in your own homes so that you can enjoy growing your own fruits while enhancing the appearance of your home. • We cultivate and deliver citrus and fruit trees in our family owned nursery and farm in Louisiana. • We also have affiliate farms in California, Texas and Florida. • Since 10 years, we have been supplying citrus and fruit trees to our customers all over the US. • You get fresh fruits and flowers. • They add to your home’s interior décor. • They create a pleasant environment. • They are ideal gifts for your loved ones. • We provide you with trees that bear blossoms and fruits even if they are just a year old. • You can find popular varieties of high-quality, beautiful citrus and fruit trees. • We offer trees at reasonable rates, with a three-year limited warranty. • Along with the trees, we also provide black grower’s pot and soil for free. • When it comes to tree care, we provide expert assistance whenever needed, via phone or email. • We adhere to the USDA guidelines and deliver healthy, vibrant trees. This entry was posted in Other Articles, Uncategorized on April 23, 2018 by LemonCitrusTree. Citrus has a certain nostalgic effect, with the fruit associated with both sunny skies and cozy Christmases. Just a few generations ago, access to citrus fruits was a novelty for people in colder climates, but lemons, oranges, and the delightful clementine are standard fare in lunch boxes and kitchens across America today. In addition, more and more hobby growers are taking a second look at citrus. Trees like the clementine are easier to care for than you might think, and there's nothing quite like picking fresh citrus from backyard branches. Clementines belong to the mandarin orange family. They are small, sweet, lunch-box friendly fruits that peel easily for on-the-go enjoyment. The variety is sometimes referred to as a "Christmas orange" because they are in season right around the holidays and many people purchase them as a seasonal treat. Clementines are very similar to tangerines, with a bright, fresh flavor in a pleasingly poppable package. Citrus gets a bit of a bad rap as being difficult to grow. Many home gardeners completely write off citrus trees as too cold sensitive. Though the clementine tree is considered a warm-weather-loving plant, they can be cared for in a warm environment. These fun fruits are ideal for USDA hardiness zones 9-11, they can actually do very well in greenhouses and in pots where moving them out of the weather is possible. For growing zones 9-11 The Clementine’s ability to bear fruit consistently is greatly hindered by unexpected frosts during blossoming, so container planting is recommended if you try to nurture clementines in less than ideal climates. When planted outdoors in a sunny climate, clementine trees resemble a standard dwarf fruit tree in size. However, container planting keeps them manageable as the tree can't outgrow the root structure in the container, and most will resemble a shrub or bush in their dimensions. A clementine tree in a container should always have sufficient drainage to avoid bogging down the roots, and it will do best when exposed to full sunlight as much as possible. In fact, it's ideal if you can move the tree outdoors when the weather is mild, only bringing it inside when temperatures dip below 50 degrees Fahrenheit. The clementine tree is perfect for budding citrus growers, as it is more forgiving than other varieties and can survive challenging growing conditions and inexperienced husbandry. With proper care and smart management, most people can successfully cultivate clementines in a temperature-regulated growing space or container, or, if you're lucky enough to live where it's warm, right in your own backyard. If you're interested in growing a clementine tree yourself, take a look at our website, as we offer many trees for you at great prices. This entry was posted in Other Articles, Uncategorized on September 8, 2017 by LemonCitrusTree. Reality Check. LCT versus competitors online claiming to sell "trees". Our company has been in business since 2004. Not a whole lot of people realize that when they visit our website. We were the first citrus farm on the internet. We started as a small family farm and even though we have grown some, we are still a small family farm. We genuinely care about all of our customers, some of them have been coming to us for years because they know we sell quality trees. We wanted to share on our blog a recent post by one of our customers to our facebook page. We hear of horror stories like this a lot and feel genuinely bad for our customers who get tricked by super low pricing and pictures of trees that look nothing like the companies actually sell. 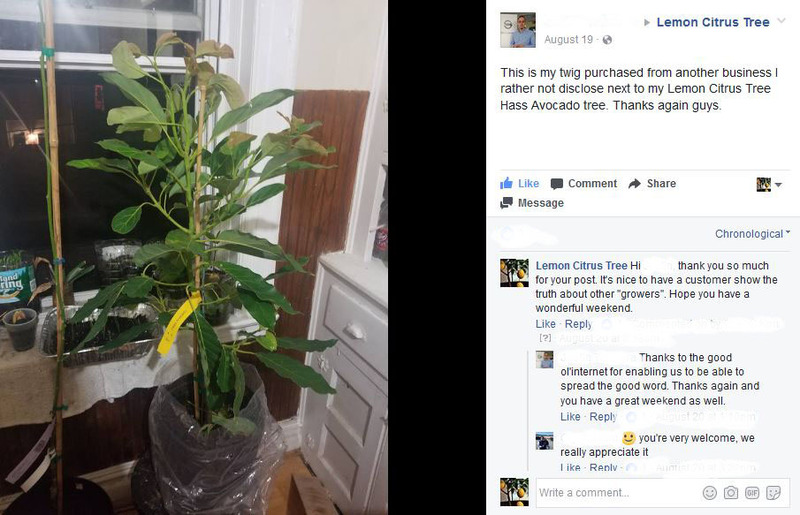 So here is a comparison of one of our customers who purchased a Hass Avocado from us AFTER he purchased from one of our "competitors". That's ours on the right, just after he unboxed it. Can you see the other "tree"? We hate that our customers are ripped off by other companies. We sell real trees that are grown by world renown experts that have been doing this for generations. We realize it's time to get aggressive and expose this fraud to hopefully protect others from falling into the same trap. If you have already purchased one of these trees from another company and are having a hard time keeping it alive, just send us an email at support@lemoncitrustree.com with a photo of the tree. We will try our best to help, just some trees can't be saved when they are raised in such poor conditions. Hope everyone has a great weekend. Take care & thanks for reading! p.s. We have a discount till next Friday! Use the code: nosticks for $8 dollars off your order. Have a HAPPY LABOR DAY WEEKEND! This entry was posted in Uncategorized on August 30, 2017 by LemonCitrusTree. We know, waiting for your citrus to ripen can seem like it takes forever. As much as you might be tempted to rush your little citrus buds along, patience really is key here. Let the tree take its time. Try to enjoy the process and pay attention to how beautiful it is. It’s natural to look forward to your fruit ripening, but growing citrus or any of your own food is about more than the end result. Enjoy the journey. More nutrients are getting packed in your fruit day by day while it's still on the tree. Citrus fruit only ripens on the vine so, if you pick it while the fruit is still green it will stop the ripening process. Citrus ripening times vary significantly which could vary from year to year as it is dependent on the weather in your area. If you have had a lot of rainy and cloudy days this could affect ripening times and cause a delay. Sunshine is crucial for ripening fruit. Your citrus tree should have at least 6-8 hours daily of full sunshine. In the winter if the tree is taken inside use supplemental lighting. There are plenty of growers lights that will work. Nurture your tree while the fruit is ripening and you won’t regret it! All citrus variety is the same, as far as starting off as a green bud. Just like tomatoes, except citrus cannot ripen off of the vine while tomatoes can. 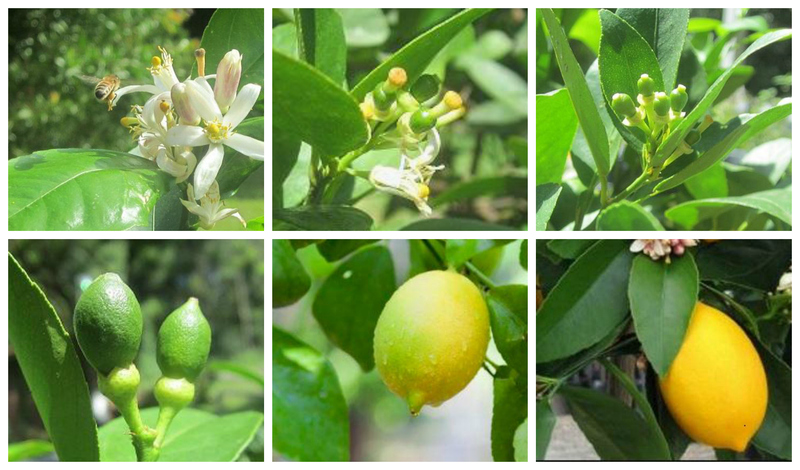 Here are some photos of the stages of the fruit ripening process of a lemon tree from bloom to being fully ripened. My favorite stage is when the tree is in bloom. The fragrance is wonderful! Very light and floral, with a hint of citrus zing. Mmm. Pictured below are some small fruit in the process of growth but premature yellowing fruit (which will turn brown eventually). Please do not panic, all fruiting trees go through stages of fruit drop. Fruit drop is when the fruit is still very immature and it begins to drop off the tree while green, yellow or brown. The tree has shut off nutrients to the yellow fruit and eventually, the fruit will drop off the tree prematurely. This cannot always be prevented, as the tree is still young and has shut off the nutrients and is reserving its energy for growth rather than maturing fruit. It is important that the tree has appropriate nutrients such as nitrogen because if it lacks nutrients it will cause fruit drop that could otherwise be avoided. 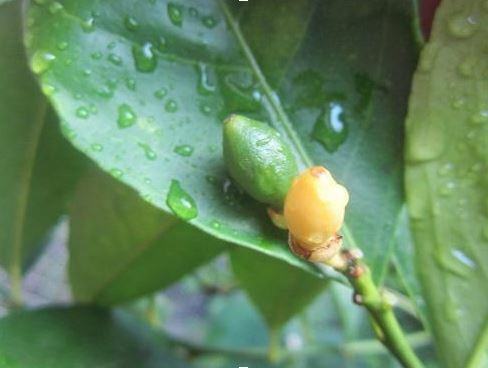 All citrus fruit (including Meyer Lemons ) will be green for about 8-9 months after they bud. It will take an additional 2-3 months to fully ripen and turn to their respective color. The Meyer Lemon ripened fruit color of the yellowish/orangish tint happens in the last month of their maturation process. The fruit is the sweetest and has the most nutrients when it has that nice orange tint. Then the fruit is ready to be harvested. The fruit picked prematurely will be more sour than normal. Please be patient, as Mother Nature moves at her own predetermined pace. This entry was posted in Tips & Ideas, Meyer Lemon Trees, Citrus Care on August 23, 2017 by LemonCitrusTree. This entry was posted in Tips & Ideas, Meyer Lemon Trees, Citrus Care on December 16, 2016 by LemonCitrusTree. This year you can use those Meyer Lemons that you've grown to perk up the flavor of your Thanksgiving bird! This recipe will work with other types of sweet citrus too or you can use more than one type of citrus to come up with your own version of this delicious recipe. Cooking should be fun and experimenting with cooking makes it even better. I have included substitutes for every ingredient that's easier and/or healthier to find or use. 1. Prepare your oven per the package directions of the Turkey that you are using for this recipe. 2. Zest Six of the Meyer Lemons, Finely Chop your Garlic Cloves & Fresh Herbs then set aside. 3. Cut Four of your Meyer Lemons into quarters and set aside. 4. In a medium saucepan melt the butter (or warm the olive oil) then remove from heat. 5. Add the Zested Meyer Lemons, Chopped Garlic, Salt & Fresh Herbs into the butter/oil and mix well. Allow the mixture to cool. 6. Rinse the Turkey and dry with clean paper towels. Rub the turkey with the butter/herb mixture completely covering the entire turkey. 7. 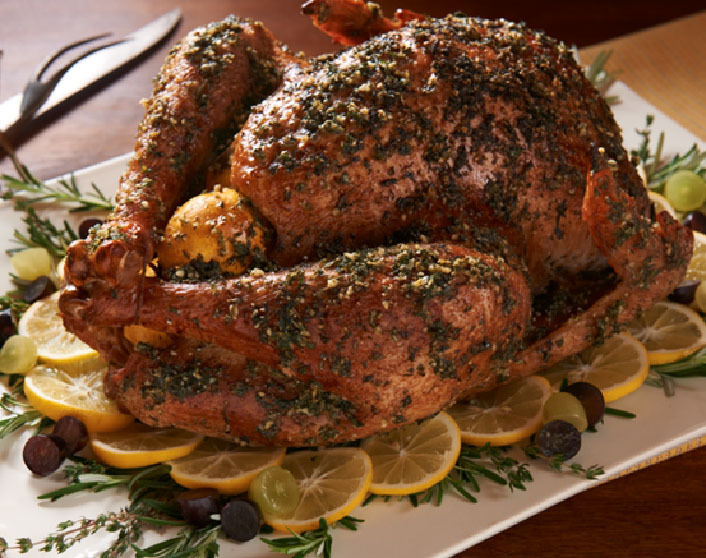 Place Seasoned Turkey into a roasting pan, stuff turkey with the quartered lemon pieces. Then roast per the directions on the Turkey label. 8. Use the remaining Lemons to garnish your turkey after cooking is complete. Typical roasting times are 20 minutes per pound at 350 Degrees. Roasting the Turkey upside down for the first 45 minutes of roasting can significantly improve the moisture retention of the meat. Adding an inch of Turkey or Chicken stock to the bottom of the roasting pan can improve the taste of the turkey and help maintain moisture in the meat. Using a meat thermometer can simplify your roasting. Just remove the turkey when it reaches 170°F. Using Food Service plastic gloves during the preparation of the turkey especially while rubbing the seasoning can keep your hands clean and prevent abrasions from the salt which can be very painful. All of us at LemonCitrusTree wishes you & your loved ones a very HAPPY Thanksgiving! This entry was posted in Tips & Ideas, Meyer Lemon Trees, Uncategorized on November 23, 2016 by LemonCitrusTree. Eating citrus and drinking the juice is more than just a yummy treat. The health benefits are immense. In fact, when I looked into it I was blown away by how good for your body citrus really is. Citrus lowers blood pressure. Sweet oranges and tangelos are the richest food sources of hesperidin. Hesperidin helps lower blood pressure along with a vast amount of other benefits. It is also found in most other citrus as it is a Citrus Bioflavonoid. Boosts immunity, and digestion: Great for cough and sinus issues. Helps with dandruff, acne and overall skin health. All of these can be attributed to the high levels of vitamin C found in citrus. Good for vision: help prevent night blindness and muscular degeneration. - Carotenoids are to blame for these amazing side effects. Anti-aging and beauty treatment: Phytonutrients help eliminate free radicals which in turn keep your skin young. Soluble Fiber: An anti-inflammatory and helps with pain of arthritis etc. It also helps cure inflammation of the blood vessels, providing protection against heart attack, strokes, and heart disease. Arthritis: The citric acid found in limes and lemons works wonders, helping move pesky uric acid through and out of the body. Uric acid is what causes arthritis. Muscle spasms and cramps: Citrus is high in potassium, this will help your muscles get some rest. Hydration: Just like our bodies, citrus contains lots of water and is extremely hydrating. Weight loss: The acids and vitamins found in citrus work as an appetite suppressant as well as helping break down fat. These are just some of the vast amount of benefit consuming citrus fruit has on your health. Drinking a glass of citrus water, eating your favorite citrus as a snack or just finding a way to get it into your meals will benefit more than just your taste palate. Citrus is truly one of nature's many magic medicines! It’s so wonderful having fresh citrus on hand! This entry was posted in Tips & Ideas, Meyer Lemon Trees, Uncategorized on November 11, 2016 by LemonCitrusTree.